Events are taking place to mark the centenary of the end of WWI. 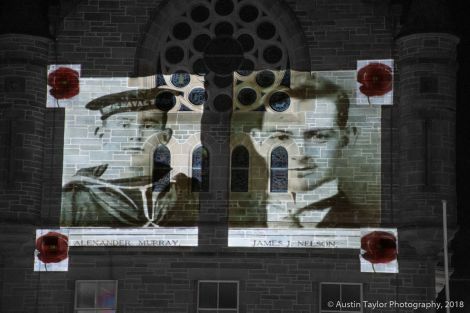 IMAGES of Shetlanders who never returned from the First World War have been projected onto the outside of Lerwick Town Hall this week as part of commemorations marking the centenary of the end of the war. 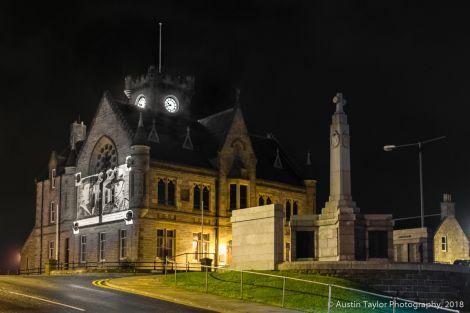 By the end of Friday, a total of 560 images will have been displayed on the north side of the town hall over three days. Those looking to catch a final glimpse at the display can do so between 6.30pm and 10.30pm tonight (Friday). 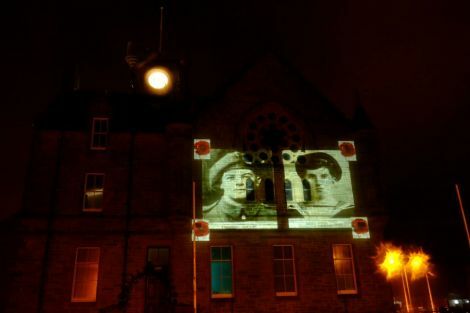 More than six hundred men from Shetland died in the war and the images included in the projection are from Shetland’s Roll of Honour. They have been collated and digitised in recent months by local history teacher Jon Sandison. A centenary anniversary commemoration service will take place at the county war memorial at Hillhead in Lerwick on Sunday at 10.50am followed by a service in Lerwick and Bressay Parish Church. The town hall bells will also ring 100 times from 7.05pm on Remembrance Sunday as part of the nationwide Ringing Out for Peace celebration. Unst, meanwhile, will mark the centenary on Sunday with the lighting of beacons at Saxa Vord, just below the RAF radar installation. A dedication will be read by community councillor Patrick Fordyce at 7pm, with beacons then being lit to signify the “light of peace that emerged from the darkness of four years of war”. A bus to the top of Saxa Vord will leave the P&T Coaches Garage at 6.10pm. To book a seat on the bus, phone 01957 711666. Parking at the top of the hill is limited so participants are asked to car share or use the bus. It all comes in addition to a previously announced day long event at the Clickimin Leisure Complex in Lerwick on Saturday, which will culminate in a festival of remembrance featuring music and readings. Beach art will also be drawn onto the sand at St. Ninian’s Isle on Sunday as part of a nationwide event called Pages of the Sea which has been designed by film director Danny Boyle.